World Disasters ... are they God's punishment? Post subject: World Disasters ... are they God's punishment? 1Now there were some present at that time who told Jesus about the Galileans whose blood Pilate had mixed with their sacrifices. 2Jesus answered, "Do you think that these Galileans were worse sinners than all the other Galileans because they suffered this way? 3I tell you, no! But unless you repent, you too will all perish. 4Or those eighteen who died when the tower in Siloam fell on them—do you think they were more guilty than all the others living in Jerusalem? 5I tell you, no! But unless you repent, you too will all perish." 8" 'Sir,' the man replied, 'leave it alone for one more year, and I'll dig around it and fertilize it. 9If it bears fruit next year, fine! If not, then cut it down.' "
Post subject: Re: World Disasters ... are they God's punishment? There is a 7.0+ earthquake every three days on Planet Earth. It just so happens that sometimes they happen near or in populated areas. wow, that is amazing. So why isn't there more tsunami warnings? 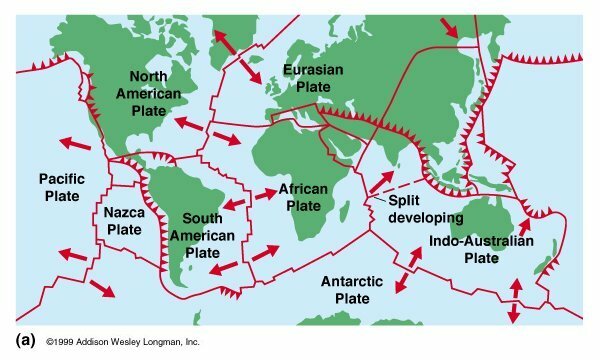 Educate yourself on plate tectonics. You can have an 8.5 earthquake 20 miles below the surface of the Earth and a 6.5 earthquake 5 miles below the surface of the Earth. Guess which one will cause more damage. You should. You're missing out. Very interesting stuff. For example, did you know the Atlantic Ocean is getting bigger because of plate tectonics? So is Iceland. Also, there are inactive faults in some interesting places that could become active again one day. For example, the Appalachian Mountains.... some form of plate activity had to form them. Several years back, we even felt a minor shake here in Alabama.... scary thing to witness. From what I've been told we are on / near a fault line. Never looked it up beofre.... but *shrug* I know for a fact I felt it and so did everyone else in Northeast bama / Southern Tennessee. , He farted and though the earth shook. I took Geology in college, plate tectonics are a fascinating subject. The severity of earthquakes depends on the type of fault line (spreading, subduction, divergent, convergent, transform fault), depth of activity, and types of soil. I actually enjoyed those lectures and course materials.